The final installment in the Evil Dead trilogy, Army of Darkness is a wild romp through the middle ages and thousands of zombie-demons! 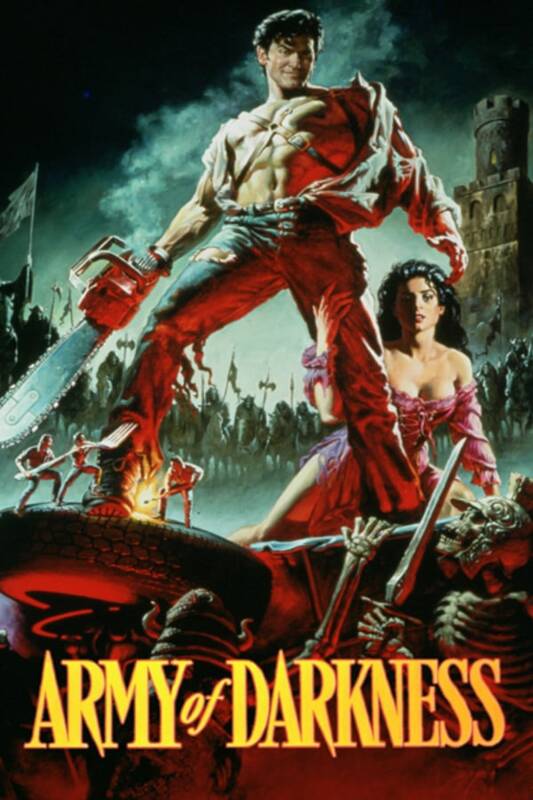 Bruce Campbell is hilarious as the heroic Ash, the man with a chainsaw for a hand and a quip for every situation - no matter how bizarre that occasion might be. Several parts of this film have already become iconic, and the oft-quoted dialogue is too good to be missed. Sam Raimi (director of Spider Man) crafts a truly unforgettable experience. Chainsaw-handed hero, Ash, is time-warped to the Dark Ages, where he battles an army of the undead! Seen it literally dozens of times since the 90s. A classic. This movie is very nostalgic for me! This was actually the first film in the Evil Dead series I watched on account that I was way too young for the other two movies at the time. I want to say that this might very well be the film that got me into horror/comedies. I will always hold a special place in my heart for this one, it never gets old in my book. "Come get some!"